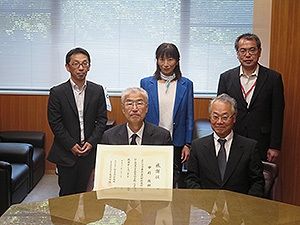 As announced in the monthly report of April this year, the collection of Denzaburo NAKAMURA (1916-1994), Researcher Emeritus of the National Research Institute for Cultural Properties, Tokyo, was donated to us by a family member, Mr. Toru NAKAMURA, on April 30th. In response to the donation, Director General Dr. Nobuo KAMEI presented a letter of gratitude to Mr. NAKAMURA on June 2nd. It is meaningful for us that Mr. NAKAMURA has understood our projects and donated this important collection for the research of modern and contemporary sculpture history. We hope to utilize this collection for our future projects. 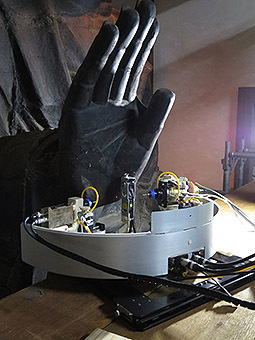 On June 20th, members of JAIMA visited us to gain an understanding of the actual practice of advanced research and development regarding cultural properties at the Institute. 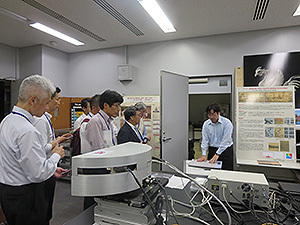 They listened to an explanation by the researchers in charge regarding their operation, while looking around the photography room of the Department of Art Research, Archives and Information Systems and the experimental laboratories of the Center for Conservation Science and the Japan Center for International Cooperation in Conservation. On June 24th, invitees to 2016 Central Asia + Japan Symposium visited the Institute after participating in the symposium to take a look at our activities. 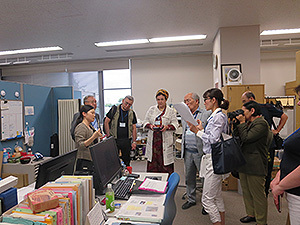 They toured the Department of Intangible Cultural Heritage, Center for Conservation Science and the Japan Center for International Cooperation in Conservation and listened to an explanation by the researchers in charge. Tai TADOKORO, the Department of Art Research, Archives and Information Systems, gave a presentation entitled “Basic Research on Gyokuyo Kurihara: Her Life and Artworks” in the department on June 28th. The Japanese-style painter Gyokuyo Kurihara, who achieved success mainly in Bunten (art exhibition sponsored by the Ministry of Education) in the Taisho period, left many paintings of little girls and women based on theatrical plays. While alive, she was thought to be the best female painter in Tokyo and to be even comparable to Shoen Uemura in Kyoto. Today, however, she is not very famous and has been little studied. TADOKORO overviewed her achievements as a painter focusing on the works displayed in exhibitions and then discussed changes in the expression seen in her works and her status in the world of art at that time. As well as materials such as art magazines and exhibition catalogues, photographs of her works appearing in women’s magazines revealed years of creation and a history of display in exhibitions of many of her remaining works. By overviewing her artworks based on this information, TADOKORO found that Gyokuyo changed the subject of her paintings around 1916 from little girls to women based on theatrical plays. TADOKORO also pointed out that strong influence from one of her teachers, Eikyu Matsuoka, can be seen mainly in the colors of the works in her last years. In particular, TADOKORO suggested that she tried a unique, unprecedented expression in the use of gold paint. Besides these creations, it came to light that she had played a major role in the world of painters, especially female painters, at that time through training of many disciples and the foundation of Getsuyokai, an organization of female Japanese-style painters, in cooperation with other female painters. We invited Mr. Toshiaki GOMI, who is familiar with Gyokuyo, to this seminar as a commentator from the Nagasaki Museum of History and Culture. Mr. Gomi gave us valuable information about the current situation of research on Gyokuyo, her remaining works in Nagasaki, and her descendants. In addition, together with Dr.Kaoru KOJIMA at Jissen Women’s University and Ms. Yuri YAMAMOTO at the Sakura City Museum of Art, attendants keenly discussed issues such as female painters and bijinga, pictures of beautiful women. A folk performing art called shishimai has been handed down in the Kariyado area in Namie Town, Fukushima Prefecture. It is a unique folk performing art that has both features of three-lion dances, which are common in the Kanto area, and deer dances or shishiodori, which are seen in the Tohoku area. However, this area has been classified as a restricted residence area due to the Fukushima No.1 Nuclear Power Plant accident and the residents had to evacuate separately to various places. As a result, shishimai was performed only twice in five years after the disaster. At present, even a meeting is not easy because some members of the shishimai preservation society have been moved to the Kanto area. Still, hoping to find a way to somehow keep it alive, the head of the society proposed a study tour for the members, which the Department of Intangible Cultural Heritage assisted. On June 18th, the society members visited Shishi Museum in Shiraoka City, Saitama Prefecture. They looked around lion masks, or shishigashira, in and out of Japan with a detailed explanation about the display and a lecture by Director Yuichi Takahashi. 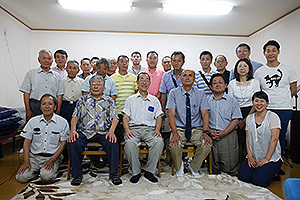 They then visited the head of the Haramamuro lion dance and stick performance preservation society in Kounosu City at his home to have an exchange between the two preservation societies. The lion dance in Haramamuro is performed by three lions, which is typical in the Kanto area, and has some points in common with the one in Kariyado. They watched a video of both performances and asked the head about measures to pass down the lion dance and the challenges they faced. 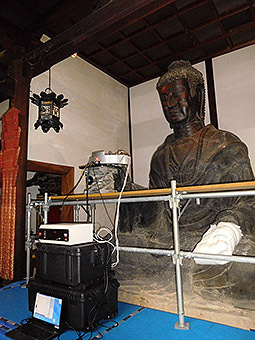 Whether intangible cultural heritages will be maintained or not in the evacuation areas due to the nuclear disaster is a serious problem that can affect continuance of local communities. While much of their future is uncertain, we think that it is important to support them so as to contribute to the preservation even a little. 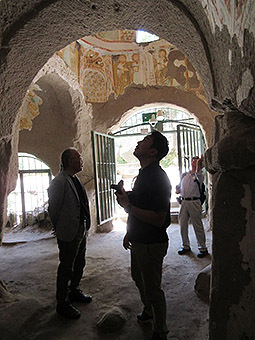 The Japan Center for International Cooperation in Conservation conducted a field survey from June 18th to 24th to understand the conservation and management system of wall paintings in the Republic of Turkey. In Ankara, we visited the Department of Conservation and Restoration of Cultural Properties, Faculty of Fine Arts, Gazi University, which has restored many wall paintings in the country, and listened to an explanation of methods of conservation and restoration that were actually used in each project. 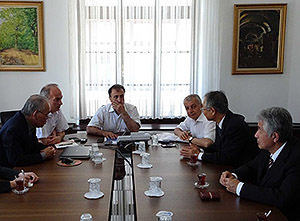 We then had a meeting with the officials including the deputy director of the General Directorate for Cultural Heritage and Museums at the Ministry of Culture and Tourism and agreed on the development of a cooperative system with the Center to further enhance maintenance and management of wall paintings in Turkey. In a courtesy visit to Hiroshi Oka, ambassador extraordinary and plenipotentiary of Japan to Turkey, we discussed topics such as the latest security situation and cultural policy in the country based on recent world affairs. As an inspection, we visited Kaman-Kalehöyük Archaeological Museum established with ODA from Japan, with guidance by Sachihiro Omura, Director of the Japanese Institute of Anatolian Archaeology, and studied the conservation state of the wall paintings in churches scattered across the Göreme district in Cappadocia and Ihlara Valley. We will continue to inspect the wall paintings in various locations in Turkey. At the same time, we are planning activities to educate conservation and restoration specialists in wall paintings and conservation and management workers who will lead operations in the future while learning about current maintenance and management of wall paintings in Turkey as well as finding room to improve and challenges to undertake.